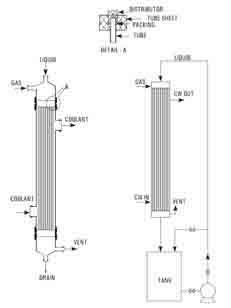 This is achieved in a Falling Film Absorber which is essentially a shell & tube heat exchanger in which both gas to be absorbed and absorbing liquid flow co-currently downward with extraction of heat by circulation of coolant in the shell. The abssorbing liquid is circulated through a tank till desired concentration is achieved. The liquid flows at such a rate that the tubes do not flow full of the liquid but instead, descends by gravity along the inner walls of the tubes as a thin film. Obviously, this produces a much greater linear velocity for a giver rate flow than could be obtained if the tube flowed full. The equipment works as a number of water cooled-wall columns in parallel and each tube is provided with distribution system on top to effect uniform distribution of both liquid and gas and also formation of a thin liquid film on the inner surface of the tube.